In the interest of cutting down on confusion I have removed the above listed items from the online site for the duration of the sale. We have done our best to include all out of stock pieces but there may be some that we missed. If you have any questions I can be reached at (978)-363-5407. I can't say enough about how great the first half of the summer has been for us here at Roberts Motor Parts: From the great cars shows to the amazing vehicles we have seen and for the visits that we have enjoyed with our customers. 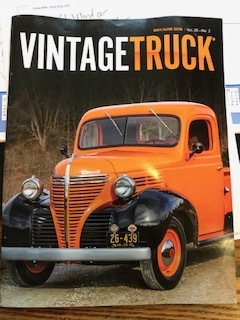 One of our long time customers Larry Jenkins of West Virginia had his truck on the cover of Vintage Truck Magazine. Larry's 1940 Plymouth truck jumps off the cover in it's brilliant orange and black paint scheme. You can see some of our contribution to that effort when you check out the fantastic hub caps that adorn this wonderful reproduction. P163A are officially licensed reproduction hub caps that fit on 1939 and 1940 Plymouth Cars and Trucks with 10 inch caps. Larry is an amazing guy and has been a real joy to do business with over the years. We are very happy for him and hope that he enjoys his truck for years to come. Earlier this summer I had a chance to enjoy a day in Boston with old friend and customer Pat Gaffney and his family. Pat, as some of you may recall restored a 1945 Blackout Dodge truck that once belonged to his grandfather in California. Pat devotes a trip every summer to a historic destination and he felt it was time to go history crazy with his boys in scenic Boston. After visits to the USS Constitution and Bunker Hill Memorial our families enjoyed pizza and arancinis in Boston's North End. While visiting colleges with my oldest child in beautiful Burlington, Vermont I caught up with Ethan Platt. 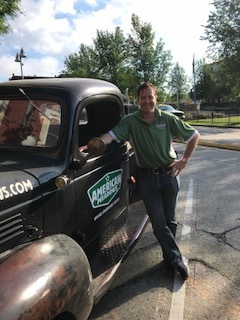 My visit inspired him to bring along his 1946 Dodge Truck for me to see. 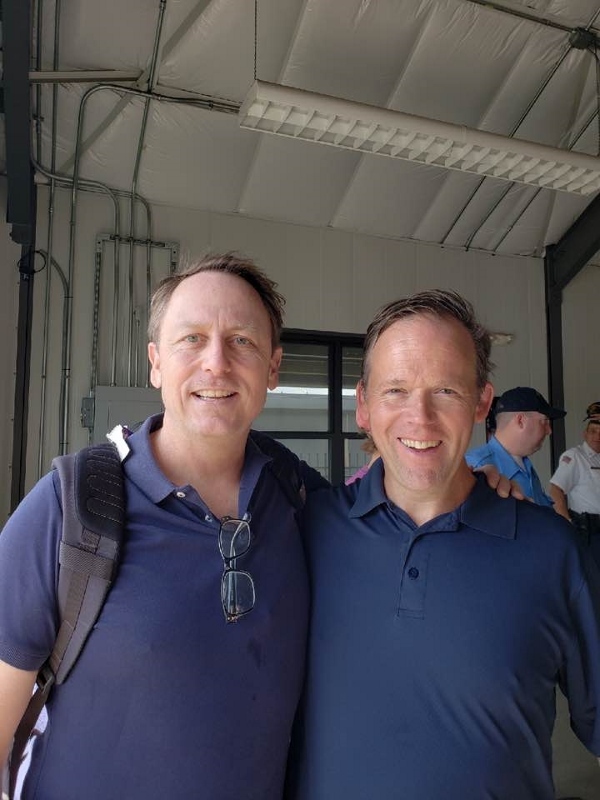 Ethan is a pretty busy fellow with small children and booming business of his own, #American Meadows, so I was especially grateful that he took the time to see me and catch up. I think he will be taking his truck to soccer games for a long time. Vent Window Rubbers for most 39-52 Chrysler, Dodge, Desoto, Plymouth and Dodge truck vehicles. If you are on the waiting list for either item you will be contacted as soon as they are back. Wherever the rest of your summer may take you I hope that it includes a few special moments in your car or truck. Well with 2017 in the rear view it's time to get excited about the year to come. 2017 was a great year for us here at Roberts Motor Parts and I hope that you enjoyed a good year too. Last fall while enjoying a family cookout our shipper and Jill of all trades Deb got the chance to meet a Mr. Sam Masteller. Sam has long admired Chrysler products and his Dad used to work at a Desoto plant in New York. He could not believe what Deb did for a living and after asking her a few questions he ran home to get something for her. When he came back he gave Deb a couple of great old books including a motors manual. Thank you Sam for the great book and for sharing our love of great cars. I have been making a lot changes to the website as of late. Over the past several months I have added over 100 new pictures. I still have a way to go to get pictures for everything but I am working on it. You will also find some web special prices on things like water and fuel pumps and some great new prices on some wheel and master cylinders. These prices won't last forever so if you are in the market for those items you should act fast. The weather has made it hard to think about the car show season but I assure you it is right around the corner. I'll be here to help you get ready so that you can enjoy your project wherever it may take you. As the summer car show season comes to end and our thoughts turn to fuel stabilizer and battery tenders it seems like a good time to get back on the blog train. P163A Hub Cap, 1939-1940 Plymouth Car and Truck 10"
I will also be receiving a limited delivery on T90 Tail Light Right hand, Dodge trucks and T161 Hood Ornament, 1941-1947 Dodge Trucks. If you are interested in these items you need to act quickly as supplies will not last. It's been a tough couple of weeks for folks in Texas, Florida, Oregon and Washington. As awful as events like these are they give us a chance to appreciate the things that matter in our lives and to be our best selves when we reach out to help our neighbors, and they are all our neighbors. My thoughts and prayers will remain with those effected and I look forward to them getting back on their feet. I hope to squeeze as much old truck time as possible in the next couple of weeks and I hope you get out too! First I need to apologize to the ground hog for mocking his ability to predict weather. After my last blog entry we were blessed with a good old fashion nor-easter, (big snowstorm for those of you not in New England). My disrespectful and mean spirited remarks directed to the 4 legged weather creature were flat out wrong, consider me humbled and sorry. In my part of the world Memorial Day weekend has always been the kick off for the car show season. The car loving public can often be seen admiring cars at both shows and parades all over the place. This provides us all with a great chance to get out and see some great cars and meet some great people. The folks who love and restore antique vehicles are some of the most passionate and generous people you will ever encounter. Before you head out and take advantage of this great resource I'd like to provide you with a few tips that will help you get the most out the cars and more importantly the great people who own them. Tip #1. Don't touch the vehicle. This may sound small but in fact it could be the most important suggestion I make. Restoration projects can take years and are often expensive. The people who devote this type of energy to restore vehicles can take days cleaning and detailing their cars. Please be respectful of their effort and investment. If it's ok to touch a car they will tell you. P.S. Keep your kids off too, just because they are cute doesn't make it ok. Tip #2 Unless you are a judge and they are being judged don't judge. This is a pet peeve of mine and I have seen this set people off more times than I can count. No one likes the guy who tells someone that their engine is wrong or that the color is a GM Blue on a Dodge Truck. Try to appreciate that honoring the past by restoring vehicles is a great way to celebrate this great country. I know many folks who love and restore vehicles that are not 100% correct, they seem happy feed off that. Tip #3 Ask the owner about the vehicle and why they chose it, or it chose them. There is nothing that I like better than hearing the stories behind why someone restores a specific vehicle. You will find your self touched in a way that will make you think about the cars and trucks in your life and they people and events that you experienced in them. I hope that these suggestions will help you make the most out of what ever events you choose to attend this weekend and the weekends that follow. Please try to take a moment to reflect on the reason behind this holiday weekend and the sacrifice that it acknowledges. According to everyone's favorite rodent weatherbeast, yes I made that up, we are slated for 3 more weeks of winter. Well at 60 degrees here in sunny West Newbury it's tough to believe that is possible. The winter can be a tough time for those of us who enjoy antique vehicles as snow and salt are not exactly the best thing for vintage vehicles. In addition to doing the normal work things, organizing, restocking, website, I like to do a few other things to help pass the time when the weather makes it hard for me to get out on the road. 1. I make sure that my batteries are all charged. Yes I know it's not exciting but nothing is more disappointing then steeping on the starter on what you hope is your first day out and hearing nothing. Charge your batteries! 2. I consider other vehicles. Lately I have been looking at Dodge Ramchargers and Dodge Pickups from the early 80's. My parents had an 87 Dodge Ramcharger that I crashed shortly after I got my license. I am not sure if I am trying to right a wrong from my childhood or not but whatever the reason that is where my head is at these days. 3. I look for car shows and events to attend. I'd say the best part of the hobby is the chance to meet people and enjoy a shared love of a wonderful hobby. In my experience the people who restore old cars and trucks are some of the most diverse and interesting people that I have ever encountered. On my shortlist for 2017 are Portland Oregon and the Myrtle Beach area. 4. I wonder if the 8 foot pile of snow that slid off of my north facing barns doors will melt by the end of April. I know I should have the kids move it but it's 60, how long can it last? Keep the faith and thank you for your interest. P.S. Center Nose Mouldings Item T141, and Headlights Item T166, will be back in stock by the 2nd week of March. I don't take the show on the road enough. 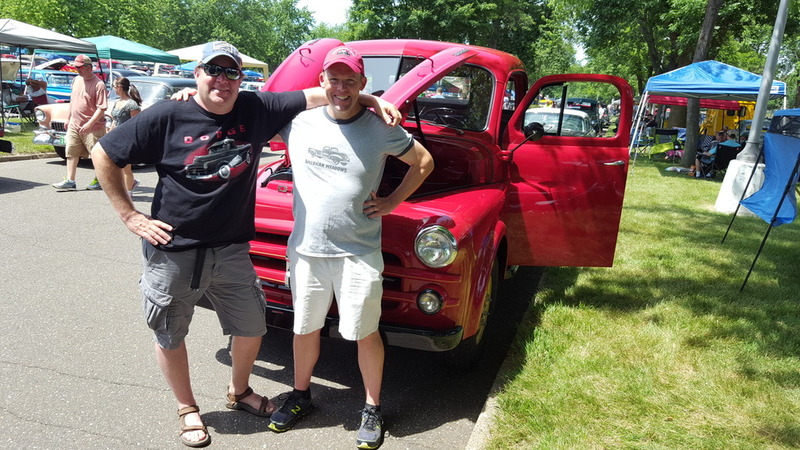 This past June on fathers day weekend after years of politely and sometimes impolitely declining Mark Fritsches invitation to come to Minneapolis and see the mother of all car shows ,"Back to the 50's", I decided to invade Minnesota. Joining me on my adventure would be my long time friend and sometime webmaster/tech advisor Gordon Kent. Mark is fairly well known in Moparland as a result of his work as a moderator at the P15-D24 forum. 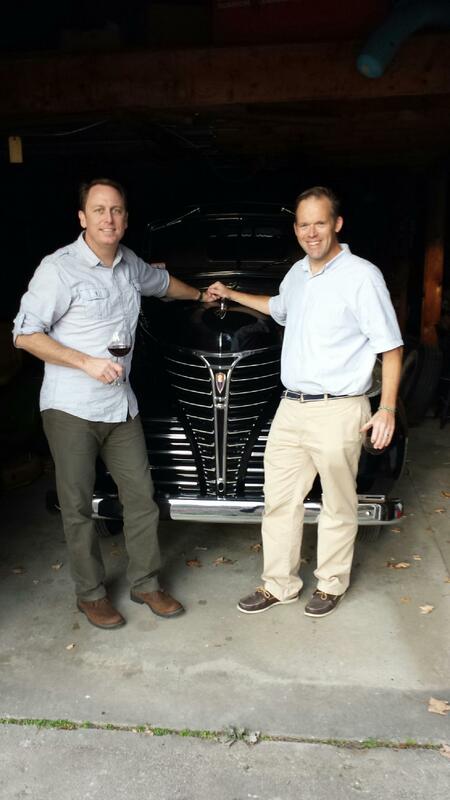 Mark is the proud owner of a 1951 Dodge Truck 1 ton which at one time belonged to his Great Grandfather. When he is not working his day job as an Engineer you can usually find him working on a his current restoration project, playing Hockey, clearing a field, doing woodworking, or volunteering as a moderator at the P15-D24 forum, lets just say he isn't idle for long. Back to the 50's is an annual car show that is held a the MN State fairgrounds on the weekend of fathers day. I grew up in the business and have been to a lot of car shows both big and small. I have seen thousands of wonderful and truly rare automobiles over the course of my life. This show was the most unbelievable thing that I have seen in recent memory. Held at the Minnesota State Fairgrounds the weekend of fathers day for almost 50 yrs There were 13,000 automobiles at this show of all makes and models from model year 1964 and older. Why 1964 you might ask? Mustangs, they don't like Mustangs and they don't want them at their show. Now I have never really been a Mustang guy but it would not occur to me to exclude them from my car show but if they don't want them they don't want them. As with most car shows I attend these days there were many 55-57 Chevy's as well as the usual Ford suspects but there were also a decent amount of Chrysler products and a nice selection of vintage trucks and custom vehicles. My meal at Butcher and the Boar. I had 3 of the best meals I have ever had in my life during my brief visit to that fantastic city! Minneapolis is a wonderful city and I can't say enough about how much I enjoyed my visit there. If you are looking for an amazing car show with super friendly people you should consider adding back to the 50's to your bucket list. 2015 has passed like a dream here in beautiful West Newbury. I started the year with a renewed spirit to really crack down and do some work on the website. I have reworked all of the parts descriptions on the site and have added over 100 pictures year to date. As the year goes on we will continue to add pictures whenever possible. New old Stock items have been added as was promised when the site was launched. These parts will be broken down by the original Chrysler group number and are listed by original part number. You can check the site periodically as we add more items and see some great hard to find items that are not available anywhere else. T113, Dodge Name Plates, 1939-1953, that go on the side of the hood. T131, inside window riser for trucks, limited supply. I have always wanted to travel to Germany, probably because of my German heritage and also because of stories my Grandfather told me about his time there during and after the war. My Grandfather said that Germany was the place that felt the most like home when he was in Europe, after they stopped shooting at him of course. Well a guy with 3 kids and his own business doesn’t have a lot of time for that type of thing so imagine my surprise when Germany came to me. On maybe the most magnificent day of the year Armin Hirsch stopped by while he was vacationing in New England. Armin is restoring a 1953 Dodge Truck and it made my day to get a chance to meet him. As the year comes to a close I find myself feeling very thankful for the blessings in my life and for the promise of what is to come in 2016. Thank you all for your continued business and support and I hope that you have an enjoyable holiday season. 2013 was a year of highs and lows for us here at Roberts Motor Parts and I will start with the good. After years of saying it was real close, we finally launched our new website. Feedback has been very positive for the most part but has also been sprinkled with an occasional “ you need more pictures”. I want more pictures too and the continued development of the site is at the top of my goal list for 2014. 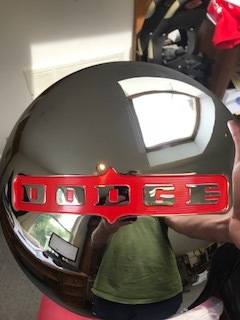 We are in the process of bringing back the Hood ornament for 1941-1947 Dodge trucks. This is was an extremely popular item when we had it last and it serves as a real compliment to the other exterior trim pieces that we offer for the W-series line. We have several other projects in various stages of completion and are we are very excited about the prospect of offering some new items. We had a Pat Gaffney sighting in New England. On Columbus Day weekend Pat came to the Boston area for the wedding of an old Army friend. I had hoped to take him for a ride in the Plymouth but thanks to Boston Traffic it took him 3 hours to get here, oh and he only drove 50 miles. He will be back for the seafood risotto. Unfortunately, 2013 also brought the loss of our patriarch Merton “Grampy” Roberts. 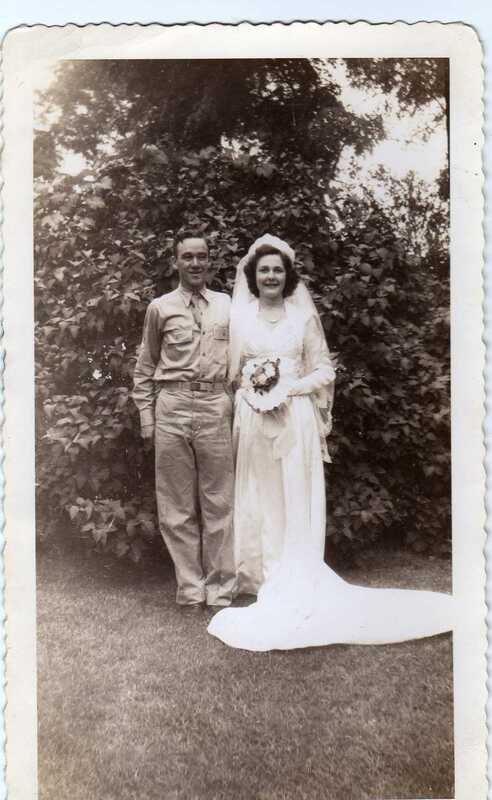 Mert Roberts was a Gunner in Company A of the 648th Tank Destroyer Battalion and fought in the Battle of the Bulge. When he returned from the war he joined the family business and became a Funeral Director. In this role he was a source of great comfort to generations of people in times of loss. Mert had a great life, survived the war, raised a family, and even knew his great grandchildren. I can’t tell you how great it felt to have my grandfather into my 40’s and I miss the hell out of him everyday. Overall we had a great year here and while we have to take some credit for that the opportunity to serve such a passionate and enthusiastic group of customers is a real privilege. Thank you for a great year and we look forward to hearing from you in 2014.